We Leave for Fiji in Exactly One Month, So Time to Get into the Car(s) and Explore New Zealand! 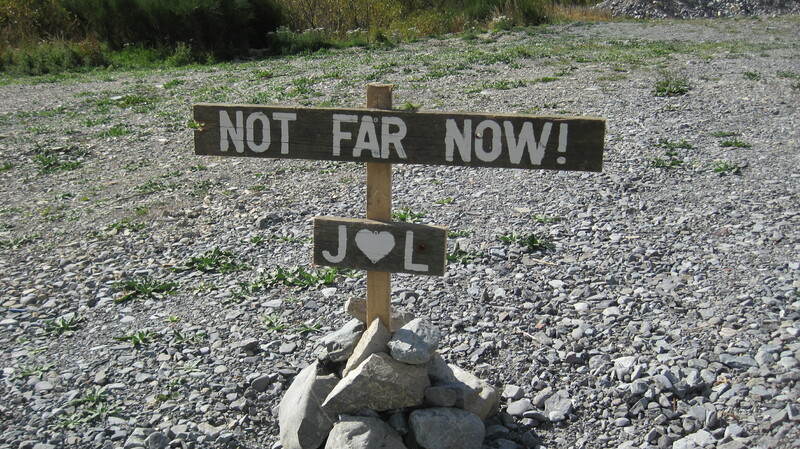 Believe it or not, our great New Zealand Adventure comes to an end in just 30 days, when Sophie points north and begins the 1,080 nautical mile return trip to Fiji. It’s been 5 short months since we arrived in this wonderful country, and we’ve seen and experienced so much here. The last 2 months have been especially busy and have included visits from the Batterberrys and the Dannelly-McKennas, the celebration of Hazel’s 6th birthday on the Auckland waterfront, and our sitting through post-cyclone Lusi and her 50+ knot gusts while securely anchored at Great Barrier Island. Jenna is sorting through 20,000 high resolution photos she has taken since January to assemble another awesome photo essay for all of you. In the meantime, what is the best way for us to celebrate having just one month left in Aotearoa? ROAD TRIP! To the South Island and beyond. The foundation of this trip is the car. 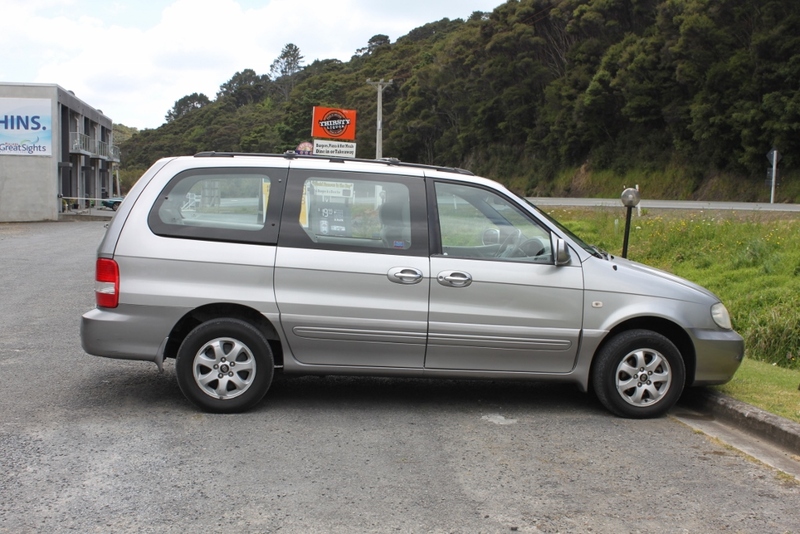 One of the reasons why we bought our wonderful Kia Carnival minivan, pictured above, for NZ$5,500 (with a guaranteed “Cars for Cruisers” resale price of $3,500 when we depart the country on May 1st) was to enable us to go on an extended tour of New Zealand’s South Island. We are currently in Franz Josef at the YHA Backpackers and just walked to the glacier, which according to the schedule is the end of Day 10 after driving here from Hokitika. It’s been a great trip so far, except for the fact that our Kia Carnival totally died on us between Abel Tasman and Kaikura on Day 5. As cheap NZ cars go, the Carnival has been good to us since we bought it in November. It has run every errand, including hauling all of us plus four Batterberrys on a 3 day mini-tour of the North Island in February. It’s done dozens of grocery and airport runs. It has a ton of room. It is a nice silver car. As I mentioned in earlier posts, I have always wanted to own a minivan, and this Carnival has been doing a decent job at fulfilling all of my minivan dreams and fantasies. Five days into our trip, and after a couple of days of hard driving over South Island mountain passes, the Carnival began to produce occasional engine knocking noises while going up steep grades. Then it started to occasionally stall in parking lots and at stop signs. We assumed (meaning we hoped) it was simply the situation of a car straining to go up the steep mountain slopes. Until the Carnival finally decided to actually, really overheat the next morning on the road back to Nelson on our journey across the island. This overheat situation happened suddenly, and when it happened we immediately stopped by the side of the road. We popped the hood, I pulled the dipstick, and saw a jet of steam coming out of the dipstick hole, a jet of steam not unlike the jets of steam we saw on our traverse of Mount Doom a month earlier. Not good. The jets of steam on Mount Doom are produced by magma near the surface of the earth. As far as I know, there is no magma deep inside the internals of a Korean minivan engine block. Fortunately, we are members of AA, which is New Zealand’s equivalent of AAA but without the “American”, and within 30 minutes of our telephone call a flatbed towtruck with a beater Toyota on the back pulled up right ahead of us. The towtruck operator Paul could legally only carry 2 people in the cab with him, and he really didn’t like the idea of carrying additional passengers in a car attached to the back of his flatbed. So he brought a loaner car with him for us to use to follow him back into Richmond, the town near Nelson where his garage was located. He rolled the loaner off his bed, he winched the Carnival up in its place, we hopped into the loaner, and followed him into town. In case you were wondering, Richmond is the home of Sprig and Fern, the best brewery in New Zealand. They produce a helles lager that makes me feel like I am back in the Wiesn, and their ginger lager is forcing me to rethink many things in my life that I thought were already concluded. Anyway, we get back to Paul’s Boutique garage, where he told us what I already knew and feared: we had blown the Kia Carnival’s head gasket. The repair would be between NZ$1,500 to NZ$4,000, and they couldn’t get it repaired for at least a week. The cost of the emotional pain and suffering we would incur resulting from a decision to not continue our awesome road trip. Jenna and I are both from Massachusetts and can occasionally be wicked smart, so we thought about this for about two minutes (and of course discussed it with each other in a caring, open, non-stressful, nurturing, and empathetic way) and decided to rent an equivalent beater minivan for NZ$55-NZ$69 per day (depending on the length of the rental.) For us it was more important to continue with the road trip. The fact that I could purchase Sprig and Fern lager throughout the South Island (which I learned during our 2 minute discussion) had absolutely nothing to do with the outcome of this shared decision. Meanwhile Leo — who had been begging us to take him to a McDonalds or a Burger King at least once in his entire lifetime — pointed out that there was a Burger King next door to the repair shop. It was noon, we were hungry, and we had 40 minutes to kill before Warwick from the beater minivan rental agency would come to pick me up so I could get our replacement car. We (I) had also promised Leo that at some point on this road trip we would go to a fast food joint. I must confess that I personally have not patronized a McDonalds or a Burger King since a late night-delayed flight-layover in Minneapolis with Tami Reller and Darren Laybourn on our way to Fargo, North Dakota. That was probably ten years ago. Jenna can’t remember the last time she ate this type of food at one of these places. But a promise to Leo is a promise, so we went up to the Burger King, ordered our food, and ate it. It was horrible. That’s not just the parents’ view, even the kids thought it was horrible. Warwick eventually showed up to accompany me to our new rental beater minivan, and Jenna stayed behind in the Burger King with Leo and Hazel and took advantage of the opportunity to have a teaching moment with the kids, laying out for them the bad things that bad food can do to your bodies. They apparently believed. Hazel has been lecturing us on the importance of eating salads and avoiding fats ever since. Score one for H! Meanwhile, I got the replacement minivan. The new ride is a Toyota Enima, and it is sweet! Oh, in my discussion of the blown head gasket in the mountain passes, I may have forgotten to mention the amount of stuff we are hauling with us: 4 bikes, 4 clothing duffle bags, 4 backpacks, 1 food box, 1 food bag, 4 other duffle bags, 1 bike helmet bag, 1 Yeti cooler (thank you forever, Steven Fell! ), 4 towels, and 1 laundry bag. 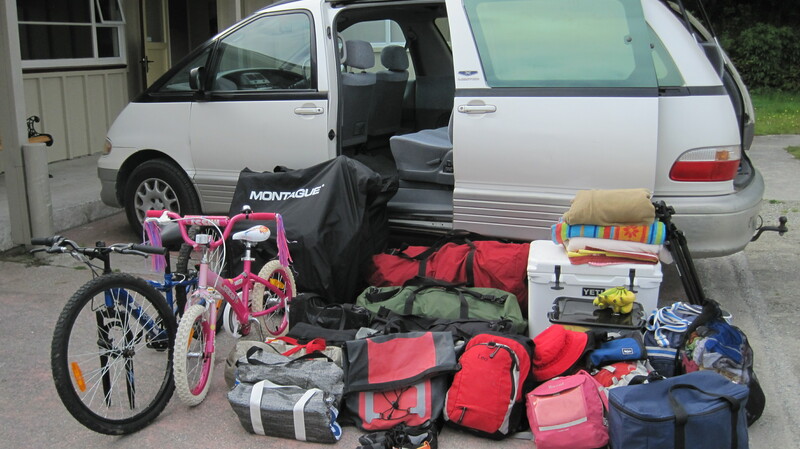 I am certain this gear had nothing to do with the strain on the Kia Carnival’s engine as we climbed 8% mountain grades, and we are thankful that the Enima can hold all of this gear. We were also surprised to learn that New Zealand is a dumping ground for used cars from Japan, which apparently has strict insurance requirements for cars that are 7+ years old. It makes sense for used Japanese cars to come here, since new cars in New Zealand are very expensive and both countries have a drive-on-the-left infrastructure. Our Enima is definitely from Japan, which means the FM radio only goes up to 88.0 and many of the buttons on the instrument panel have labels written in Japanese. But the new set of wheels handle the New Zealand South Island mountain passes and coastal straightaways with ease. 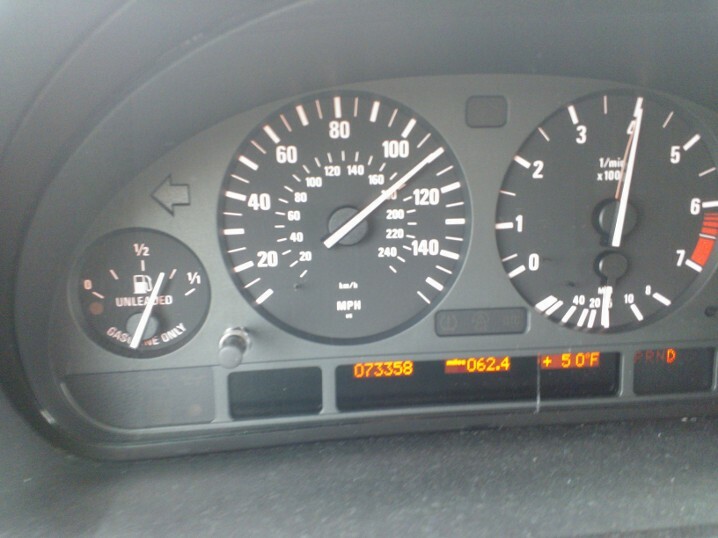 This photo above is similar to one I took for the blog 15 months ago in Texas when we crossed the USA in our BMW X5, except this time the gauge displays 100+ KPH as opposed to 100+ MPH. Same idea, though. 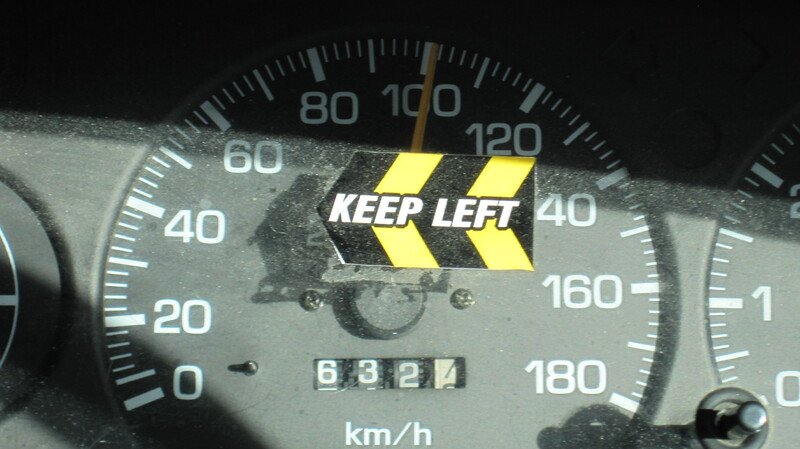 I am not sure if the “Keep Left” sticker is there to remind tourist drivers of New Zealand’s primary road rule or to prevent them from dwelling on the fact that their beater rental minivan has 220,000 KM under its belt. In the good news department, we learned today that the repair shop in Richmond (did I mention that Richmond is the home of Sprig and Fern, the best beer in New Zealand?) 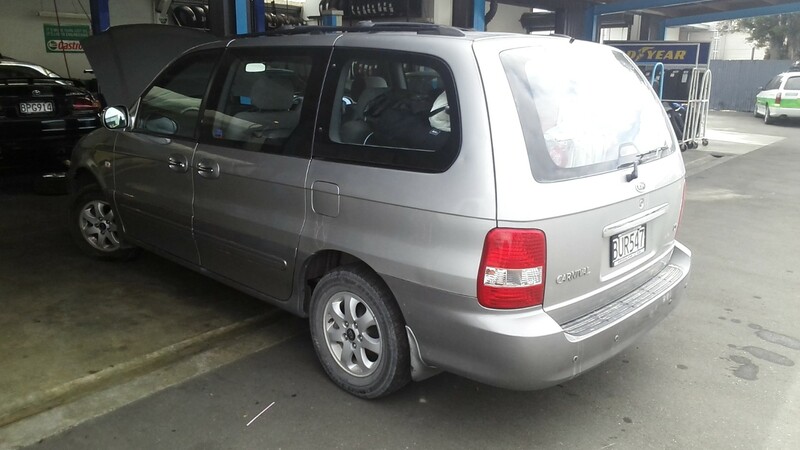 now thinks that the problem with the Kia Carnival may not involve the entire head gasket but simply a single cylinder. This will hopefully contribute towards a lower repair cost. Regardless, our road trip will continue. We left Sophie on a dock in Opua, where we are having some final repairs done in our absence, including the installation of the correct diesel heater parts and the completion of our 230v inverter swapout. We will also have the folks there install a propane line that runs to our transom, so we can mount a permanent gas barbecue on our stern rail to more easily cook all of the fish we plan to catch upon our return to the tropics. Then we will be joined by our Seattle friends Ravi and Alison, who haven’t done any offshore sailing but are adventurous souls who quit their comfortable jobs in America to spend a year backpacking the world. We will also be joined by DAN ROGERS! He is the Best Man from our wedding, the person who shares a birthday with Leo, the person who taught me how to fish, and the person who helped us guide Sophie from San Diego to the Marquesas. 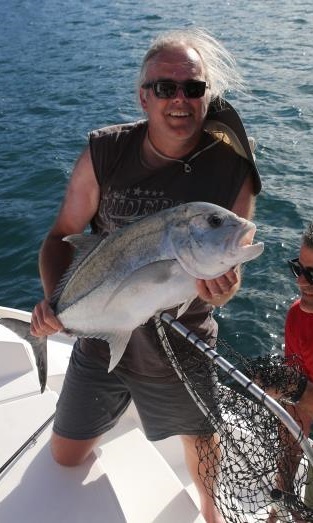 He caught what I now realize is a really big trevally, pictured above, when he was with us in the Marquesas. The seven on us will depart New Zealand on Sophie on May 1 (weather permitting) and head for Fiji. Since the prevailing winds down here tend to blow from the southwest, it is theoretically easier to head north than it is to head south in this part of the world. We hope to do the passage less than a week, similar to the amount of time it took us to head south to New Zealand last November. We also plan to take advantage of Sophie’s motoring range and will be quite happy to exchange diesel fuel for safety in order to get up to the tropics more quickly. Waiting for us in Fiji will be our friends Ian and Becky, you know, the couple who became famous for being hooked on fishing. 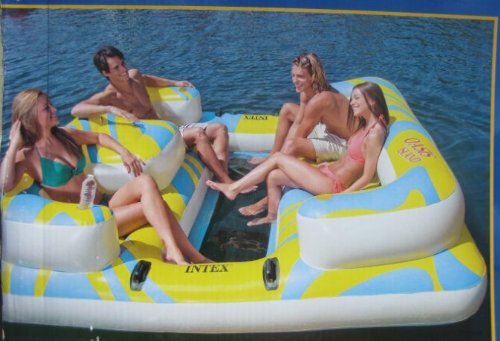 And they are bringing with them a brand new Relaxation Station — a floating inflatable conversation pit — which we hope will become Sophie’s own portable version of the former Fiji surf resort “Cloud Nine“. Let the (Southern hemisphere) winter begin! Have I mentioned lately how lucky we are?